Join the Concert Band for this exciting performance featuring winners of the 2019 Collegiate Symposium. This side-by-side performance will include classic and contemporary literature for Concert Band as well as highlighting the talented college students from across the country! This concert is FREE and open to the public, tickets required. 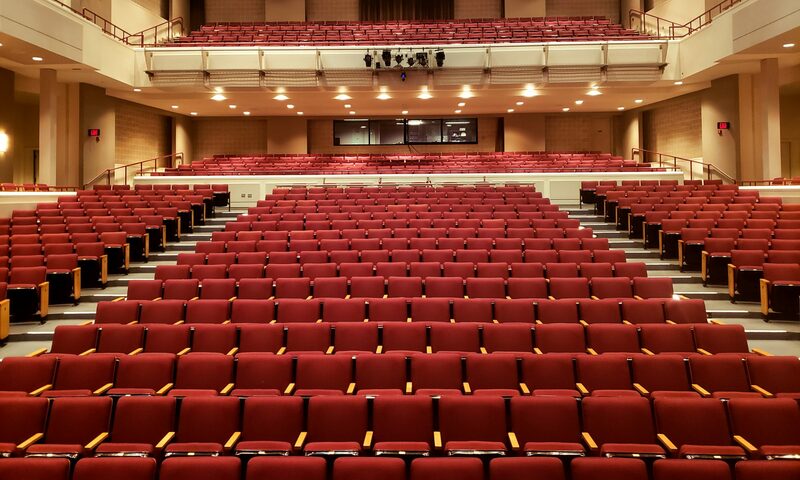 All unclaimed seats will be released to non-ticket holders 15 minutes prior to the performance. Doors open at 7:30 p.m. FREE parking in the garage across the street from the performance hall. 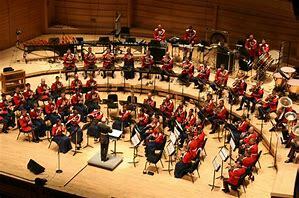 The United States Air Force Band Collegiate Symposium offers a unique opportunity for talented college musicians to immerse themselves in one of the world’s finest professional wind ensembles. This three-day workshop encompasses a variety of events to enhance musical growth and learning. 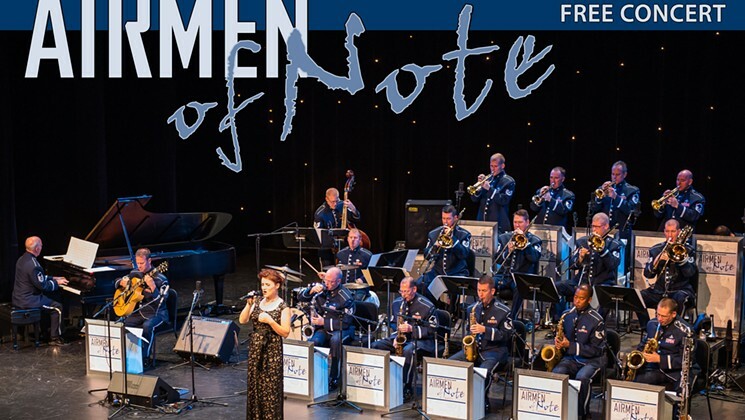 The weekend culminates in a joint public and live-streamed performance with the U.S. Air Force Concert Band at the Rachel M. Schlesinger Concert Hall and Arts Center in Alexandria, VA.
Join the Airmen of Note for the return of the 2019 Jazz Heritage Series featuring world-class jazz trombonist John Fedchock. 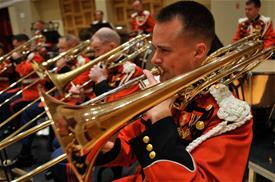 This performance will feature big band classics and original jazz compositions. This concert it FREE and open to the public, tickets required. John Fedchock is an American jazz trombonist, bandleader, and arranger. Fedchock studied at Ohio State University and the Eastman School of Music. He worked for several years in the Woody Herman Orchestra in the 1980s and was noted for his arrangements. He also worked with Gerry Mulligan, Louie Bellson, Bob Belden, Rosemary Clooney, and Susannah McCorkle. He recorded his first album as a leader in 1992 with the New York Big Band, which was active into the late 2000s. Fedchock’s illustrious career in jazz has spanned over three decades. Since his emergence on the scene in 1980, Fedchock has established himself as a world-class trombone soloist, a heralded bandleader, and a Grammy-nominated arranger. An in-demand performer and writer in New York City, his multifaceted talents have led him to become one of NYC’s premier jazz artists. His critically acclaimed John Fedchock New York Big Band has become a marquee group, showcasing Fedchock’s trombone and arranging as well as the band’s all-star soloists. The JFNYBB’s five CDs on the MAMA and Reservoir Music labels have all received high praise from critics and extraordinary success on national jazz radio charts. The early success of the band resulted in Fedchock’s name appearing in DOWNBEAT’s Readers Poll under the categories of Trombone, Arranger and Big Band, simultaneously for several consecutive years. In recognition of his formidable arranging skills, Fedchock is a two-time GRAMMY Award nominee for “Best Instrumental Arrangement”. The JFNYBB’s recordings have appeared in jazz radio’s Top Ten, and the New York Times has applauded the band’s “Cheerful Syncopation, Served With Spit-and-Polish Precision.” Small group projects with his quartet and NY Sextet showcase A-list sidemen along with Fedchock’s “incomparable trombone playing, which seems to have no limit, technically or musically” (JazzReview.com). The 2019 Guest Artist Series kicks-off January 24th with International Trumpet Sensation Allen Vizzutti! This concert will feature the Concert Band and an exciting lineup of classical and jazz inspired compositions highlighting the virtuosic skills of Allen Vizzutti! Allen Vizzutti has visited over 60 countries and every state in the union to perform with a rainbow of artists and ensembles as both a classical and jazz artist. He has appeared as guest soloist with symphony orchestras, in recital, on television and in jazz venues around the world. Allen’s soaring trumpet sound can be heard on over 150 movie and game soundtracks including ‘Star Trek’. ‘Back to the Future’, and ‘Halo’ and ‘Medal of Honor’. Allen’s love of expression through composition has led to premier performances by the Los AngelesPhilharmonic, Budapest Radio Orchestra, the Royal Philharmonic of London, the NurembergSymphony, the Minnesota Orchestra, the Summit Brass, the US Navy and Air Force Bands.He is a strong proponent of music education and his “Allen Vizzutti Trumpet Method” hasbecome a standard treatise used worldwide. The Margaret W. and Joseph L. Fisher Gallery presents Brian Dailey’s “America in Color” and “WORDS”. Over the course of a two-year period, Brian Dailey travelled across the country with the objective of capturing individual portraits of the uncelebrated American electorate. From Jackson Square in downtown New Orleans to the open rancg in Texas he organized impromptu photo shoots with more than 1200 citizens, including those with no interest in politics or voting. In the portraits each individual expresses their personal identity casually in dress and pose, while their political identity is expressed more formally through the selection of a colored backdrop: blue for Democrat, red for Republican, grey for Independent, Green for the Green Party, and yellow for those who don’t vote. The resulting monograph, Brian Dailey: America in Color, challenges our perceptions of the component and individual characters that shape the American political process. Brian Dailey’s towering, multi­ screen video installation WORDS­ the creative summation of an odyssey that took him to nearly ninety countries over the course of six years-is the artist’s investigation into the impact of globalization on the interrelation between language, culture, and environment. 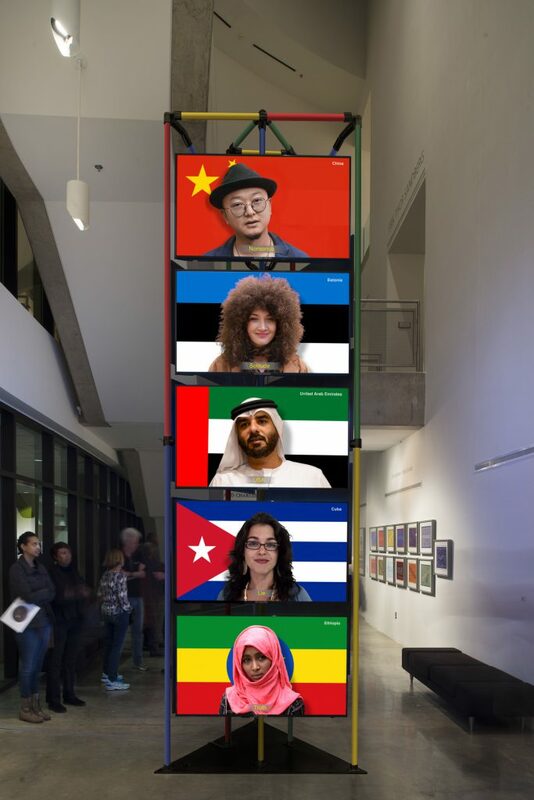 Each of the thirteen screens display a video composite of selected single-word responses in participants’ native languages to one of the thirteen words around which this project evolves: peace, war, love, environment, freedom, religion, democracy, government, happiness, socialism, capitalism, future, and United States. Brian Dailey (MFA, Otis Art Institute, 1975: PhD, International Relations, University of Southern California, 1987) is an American artist noted for his careers in both art and international relations. His work in a variety of mediums-including photography, film, installations, and painting-engages with the social, political, and cultural issues of our times and is not easily categorized. Dailey’s art reflects his unconventional evolution as an artist and multifaceted life experiences, which include national level involvement in arms control, space policy, intelligence systems, and international security. Dailey has had solo exhibitions in Los Angeles, New York, Washington D.C., Bulgaria, and has participated in a number of group shows in the United States, Europe, and Russia. His mid-career retrospective Declassified: Unraveling a Paradox took place at Bulgaria’s National Art Gallery in Sophia in 2014. An Odyssey, a solo exhibition in 2017-18 at the Washington D.C. alternative art space, Dupont Underground, featured his digital work. 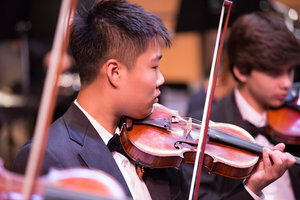 American Youth Philharmonic Orchestras presents AYP in Concert. Our modern urban environments have served as inspiration for all kinds of musicians. Jonathan Newman’s Symphony No. 1, My Hands Are a City is a musical depiction of the nation, specifically New York, through the lens of mid-twentieth century “beat” artists like Jack Kerouac, Allen Ginsburg, Charlie Parker, and Robert Frank. Newman’s music takes us “On the Road” and introduces us to “The Americans” before returning to the “Rivers of the Bowery.” The historic city of Vienna inspired Franz von Suppe’s Overture, depictings scenes throughout the day in this musical gem. British composer Adam Gorb’s Adrenaline City Overture is inspired by twenty-first century life in London, both stressful and vibrant, while Aaron Copland’s Quiet City displays the moments of solitude and quiet that inhabitants are capable of stealing away during a late night in the city.